Those who know me for any length of time come to know that I love plants and gardens. In many ways they can be smarter than people. Tomatoes are one of my favorites. 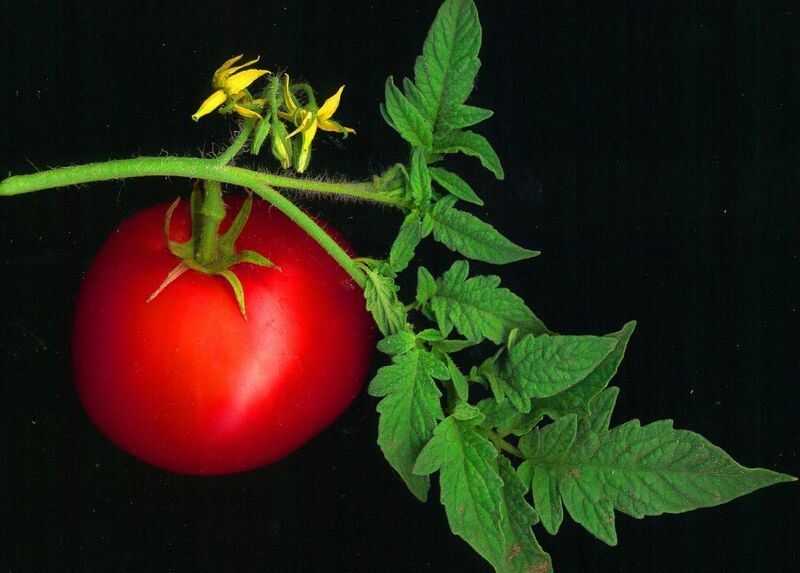 Each tomato type or variety has characteristic temperatures. Freezing will cause die off in substantially all of them (they are not ‘frost hardy’ though I’ve had some survive a light frost with only peripheral die back); but that is common to all frost sensitive crops. At the other extreme, when it’s too hot you can have problems with things like cracking (if you water a lot after a hot dry spell). In between, there are varieties that “set fruit” at different temperatures. For most sorts, 50 F is a key temperature. Above that, you get fruit. If it falls much below that at night, you get no fruit. The reason is rather simple. The pollen grain will last for 3 days once it sprouts. It has 3 days to fertilize and make fruit. But it grows more slowly in the cold. So at some key temperature it will form and sprout, but can’t “set fruit” before the pollen grain dies off. There are some more cold tolerant varieties, like Siberian, that will set fruit at lower temeratures (some claim down to the 40’s F range). This matters for folks like me who live in a marginal tomato area. We either grow a cold tolerant type, or resort to cloches, greenhouses, cold frames, etc. (Just covering at night can retain enough heat to set fruit in marginal conditions). And that is why I’ve adopted the Tomato as the logo of choice for my analysis of GIStemp and why I’ve adopted the tag line “GIStemp, dumber than a tomato” under the GIStemp tab up top. “Plants are extremely sensitive to temperature changes in their environment. They can even detect changes of as little as one degree Celsius. Just how they do so has puzzled scientists until now. New research has uncovered a “thermometer gene” that not only helps plants feel the temperature rise, but also coordinates an appropriate response. The long-running spell of cold weather has continued to ravage Florida’s tomato crop, leaving consumers paying top dollar at the grocery store and coming up sliceless at fast-food venues. The prices that consumers will end up paying could double as supplies start drying up in Mexico, said Jesus Noriega, a produce buyer with the Associated Grocers of Florida. “We’ve had to move to Mexico, and now Mexico is running short itself due to heavy rains,” Noriega said. So it’s a return to what was in prior decades. A frigid Florida winter is taking its toll on your sandwich. The Sunshine State is the main U.S. source for fresh winter tomatoes, and its growers lost some 70 percent of their crop during January’s prolonged cold snap. Wholesale prices are up nearly five times over last year. That means you can say goodbye to the beefsteaks on that burger and prepare to pay more than usual for the succulent wedges in your salad. An unusually cold January in Florida destroyed entire fields of tomatoes – along with some green beans, sweet corn and squash. The cold scarred the tomatoes, damaged their vines, and forced many farmers to delay their harvest. The average wholesale price for a 25-pound box of tomatoes is now $30, up from $6.50 a year ago. Florida’s growers would normally ship about 25 million pounds of tomatoes a week; right now, they’re shipping less than a quarter of that, according to Reggie Brown of the Florida Tomato Grower’s Exchange, a tomato farmer cooperative in Maitland. And prices are going up. A lot. Some parts of Florida saw average temperatures so low that this January and February were among the 10 coldest on record, according to the National Weather Service. And now we are back where were were long ago. And that “worry about the frost” has become a reality. Yet I would hazard a guess that many of the tomato producers in Florida got into the business in the last 20 – 30 years and did not have the experience base of a cold PDO/AMO/etc. phase to draw on… Well, they will start learning now. “Anecdotally, from talking to some real long timers, as well as people who watch the weather, this has been the most extended cold in maybe 60 years,” said Terry McElroy, spokesman for the Florida Department of Agriculture. Results 1 – 10 of about 42,900 for Florida cold tomato shortage 2010. Global Warming: So who you gonna believe, “ClimateGate Scientists” or your own lying eyes and your tomato prices? Right now, I’ve got cabbage doing fine along with an odd “Kale / Collards” hybrid I’m working on. (It does well in both cold and hot… and the flavor is better than kale and less bitter than collards. One parent was a “Green Glaze collard” which is itself a hybrid with a cabbage, to get the glossy lighter green leaves.) It is in flower now (3rd time! in 2 years) and It looks like I can make a perennial Collard out of it. I’ve got enough seed now that I can plant out a larger patch and see if I can make a “square” of perennial Collard Greens. Time for the R&D phase to see how it does “in production”. I’ve also got a “Golden Mangle Beet” that is in it’s second year and doing fine. I’m using it for greens and to create a seed bank. It looks like it just might go multi-year here in California. Technically it’s called a bi-annual, but I’m on the edge of year three here. It has already set seed last year and I collected a pot load. ( I’m working on a perennial beet for beet greens year round here in California). The Mangle Beet is an older type and less ‘refined’ into the “grow and die” pattern of the more recent beet types. Basically, it’s a bit cold and wet right now. Nothing really out of the ordinary for California. So my cold plants are doing fine. But it will be a while before I can get a tomato going. We often put tomatoes in about April, or May if you are a worry wart. It’s not looking good for that right now. But we’ll see. I do have some potatoes that have their tops up and are doing OK. These are a selected type that have been growing here for a decade or so and are well adapted. They started as a “Russian Banana” so are cold tolerant. Some are grown from seeds (yes, potato seeds – I’ve had a couple set fruit over the years!) so it’s slowly evolving to suit this exact micro-climate. I’ve grown a couple of other types near it over the years, so the exact type from the seeds will be a mutt. I found the “heavy rain” in Mexico an interesting comment. The Maya Dresden Codex predicts that 2012 will be met with heavy rain and a deluge from the sky. It does not really predict the end of the world, just the end of a grand calendar cycle. The last time we were in this phase of the Maya calendar, the Ice Man was walking a path through the Alps (with an arrow in him) and fell while it was snowing. It kept on snowing until he was under a glacier. So it was this warm then, but it got cold for a few thousand years. In Peru, the ice caps of the Andes have melted back to expose preserved green plants – last seen at the time of the last Maya calendar transition. So the glaciers there, then, were about where they are now. It was warmer then (there are some greens still under the glacier) and has been colder since. This entry was posted in AGW and Weather News Events and tagged Global Warming. Bookmark the permalink. It’s not cold here in Western Washington right now. But Tomatoes don’t grow well here at all, mainly because there isn’t enough sustained heat in the summer. You need a proper greenhouse to grow them well. The tomato is a delicious everyday habit in my family. Glad to see it is so savy re “climate change”. I noticed: “I found the “heavy rain” in Mexico an interesting comment. The Maya Dresden Codex predicts that 2012 will be met with heavy rain and a deluge from the sky.” I noticed because I have begun watching representations of the NH jet stream. One arm of it has been jamming across Mexico for quite some time. This seems similar to when So California was being deluged. Now we barely get spitters. Is this a climate condition that will continue and increase as we move toward 2012? I’m also pretty sure that the Maya were great observers of natural cycles. They pegged a many thousand year galactic motion ‘spot on’ (about 25k year IIRC). I just wish we had even 1/10 of their records to look at. (Damned Spanish Church…) We might actually have found a 5,000 year record of temperatures and weather cycles. What we do have says that ‘about now’ in 2012 we ought to get loads of rain where they were, and we’re starting to get loads of rain where they were… Gotta admire ’em for that. And if that plays out, then we have a multi-hundred year prediction of cyclical weather that claims a 5200 year or so natural cycle. And that means that any notion of “30 year climate” is just so broken as to be a very bad joke. Climate changes when you change your altitude, latitude, distance from water, or surrounding topography (i.e. take out or put in a mountain range between you and the water). If yo are not talking about that, you are not talking about climate. You are just talking about weather, with it’s 5200 year cycles and all the sub cycles including the 60 year PDO, the AMO, the 11 year sun spot cycle, etc. So IMHO, we have “Climate scientists” who are really just “weather cycle deniers” and they need to look out the window and read a few history books… They also are, compared to the Maya scientists and historians, better suited to clown cars than lab benches. Perhaps it has something to do with the Maya “priests” being killed if they messed up… now THAT’S motivation to get it right ;-) But for now all we have is a codex, a prediction of massive rains, and 2 years to wait. We’ll see how good a call they made when the time comes. It has to be one of the longest range weather forecasts ever made! E.M.: Your comment, “Climate changes when you change your altitude, latitude, distance from water, or surrounding topography (i.e. take out or put in a mountain range between you and the water). If you are not talking about that, you are not talking about climate.” is bang on target. This winter has been brutal on plants in Texas. I’ve seen lots of dead irises, oleander and bougainvilla in the southeastern portion of the state. These plants usually make it through the winter without too much damage. The irises may come back but I’m not so sure yet about some of the bougainvilla. The St. Augustine grass is as dormant (straw brown) as I have ever seen it. The landscape in general has looked more like what you would see in winter in Oklahoma. Bleak, in other words. Bulbs like daffodils and tulips are looking great. My dwarf grey sugar snow peas made it through the winter and are blooming profusely and already have lots of fruit. My strawberry plants are also doing great although they are lower to the ground and smaller than in winters past. They have more blossoms and fruit at an earlier date. I live near Cupertino. My plum trees are not quite fully blossomed out (almost, but not quite). They are two weeks late in blossom. It’s as bad as you say, SWFL tomatoes are $5 a pound, as the crop was about 90% wiped out in the cold spells that never seemed to end. Not to say anything about the fish in SWFL … Which has taken quite a pounding from the cold. Especially our coveted ‘snook’ … The die offs have been very visible along the beach, the shoreline lined with the dead and dying. “This page features the trends in mean and seasonal temperatures for Alaska’s first-order observing stations since 1949, the time period for which the most reliable meteorological data are available. The temperature change varies from one climatic zone to another as well as for different seasons. If a linear trend is taken through mean annual temperatures, the average change over the last six decades is 3.0 degrees F. However, when analyzing the trends for the four seasons, it can be seen that most of the change has occurred in winter and spring, with the least amount of change in autumn. Considering just a linear trend can mask some important variability characteristics in the time series, the figure shows clearly that this trend is non-linear. A linear trend might have been expected from the fairly steady observed increase of CO2 during this time period. 5-year moving average demonstrates large increase in 1976. The period 1949 to 1975 was substantially colder than the period from 1977 to 2009, however since 1977 little additional warming has occurred in Alaska with the exception of Barrow and a few other locations. I found the comments on linear and non-linear trend, CO2 and the Pacific Decadal Oscillation very enlightening. What do you think?